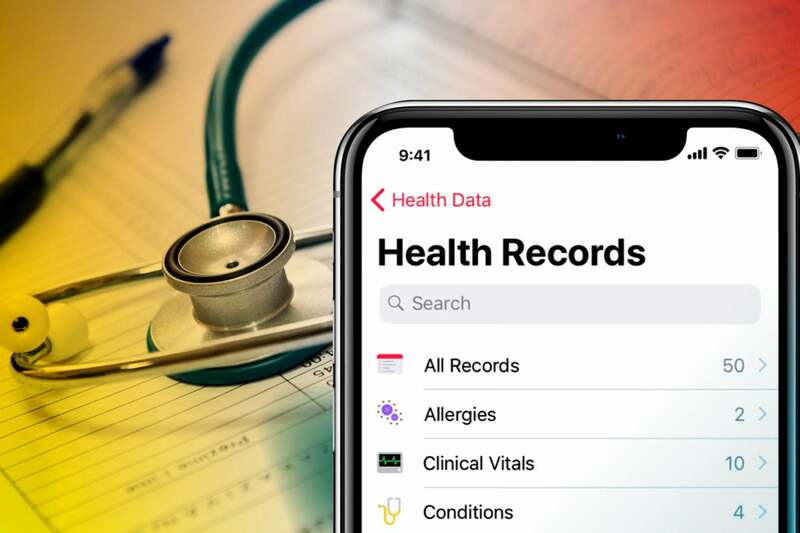 Apple may have finally found a way to enable the large-scale sharing of electronic medical record information on mobile devices. But its tools won't replace the old tried-and-true fax for data-sharing in healthcare. Apple's Health Records feature in the upcoming iOS 11.3 rollout may be the most high-profile attempt at sharing healthcare data between caregiver and patient, but it won't succeed without industry's cooperation. What is new is the mass market Apple commands with its iPhone and iPad and the company's efforts to take advantage of new industry standards and collaborative alliances for aggregating and sharing patient data from disparate healthcare systems. Even with the digitization of healthcare information and advances in networks for sharing that data, however, one industry stalwart is unlikely to be replaced: the fax. Virtually all healthcare organizations continue to use the facsimile, even as the industry has been forced to adopt modern electronic medical records (EMRs) and online data-sharing methods. The fax protocol is used to transmit laboratory reports, send prescriptions and authorizations and transmit payment information between hospitals and insurance companies. The reason the fax isn't going away anytime soon is that it's simply too well ingrained in back office systems. "People use it as lowest common denominator. You could call it the great unifier in letting all these disparate systems talk to each other," said Bill Ho, CEO of Biscom. "And, healthcare is ... a little bit conservative when it comes to adoption of new technology." In 1980, Biscom launched the fax server industry, turning what was previously all paper-based fax machine systems into electronic file sharing. Even today, many of Biscom's healthcare customers send tens of thousands of faxes per month. For example, the Seattle Cancer Care Alliance sends and receives an average of 10,000 faxes every month, and Massachusetts General Hospital sends 25,000 to 30,000 faxes per year using Biscom's service. And all EMR systems have a fax tool embedded in them, or at the very least a computer system's "print" command allows for a fax option. The screenshot is from a test server using GE Centricity's EMR. 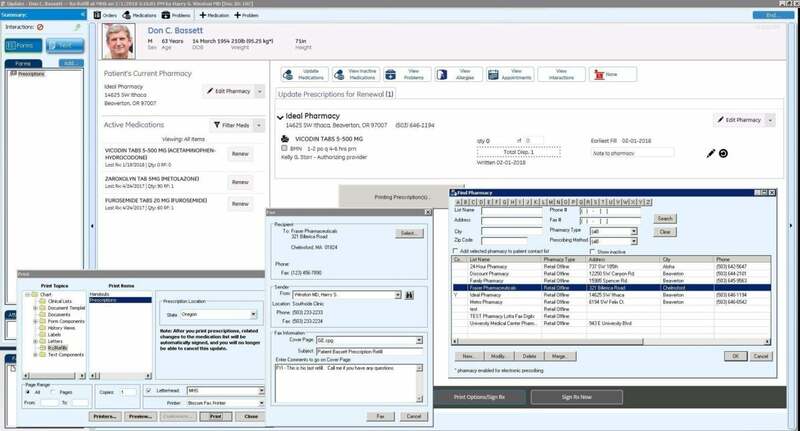 The screenshot shows the process of going into a patient record and performing a prescription refill via the fax protocol. "People have this image in their head of someone standing in front of a fax machine and sticking paper in to it. Today it's all digital. Most faxes never hit paper," Ho said. Eventually, as Apple envisions, a new electronic document system will prevail. But it's going to be a very slow changeover, according to Ho, whose company does offer other forms of electronic file exhange. "Healthcare is a large, complex, multi-faceted system, and I don't think we're going to see rapid disruption," Ho said. The fax isn't used to communicate between healthcare providers and patients; for that, Apple's Health Record tool may finally usher in a new age of data sharing. But it's not close to being the first to try. Past efforts by even big-name vendors are not well known because they didn't get very far, according to Mutaz Shegewi, IDC's research director for healthcare provider IT transformation strategy. Part of the problem is many of the previous EMR data exchange efforts relied on the patient to populate the app. Patient portals and personal health record (PHR) technology, such as Microsoft's HealthVault, Google's Health service, Allscripts's FollowMyHealth, WebMD's NoMoreClipboard and Zweena's Health Record, have attempted to persuade the healthcare and its customers that patient data could be shared on consumer devices. "PHRs relied on the user to build it. That's where it was limited in its usefulness," Shegewi said. 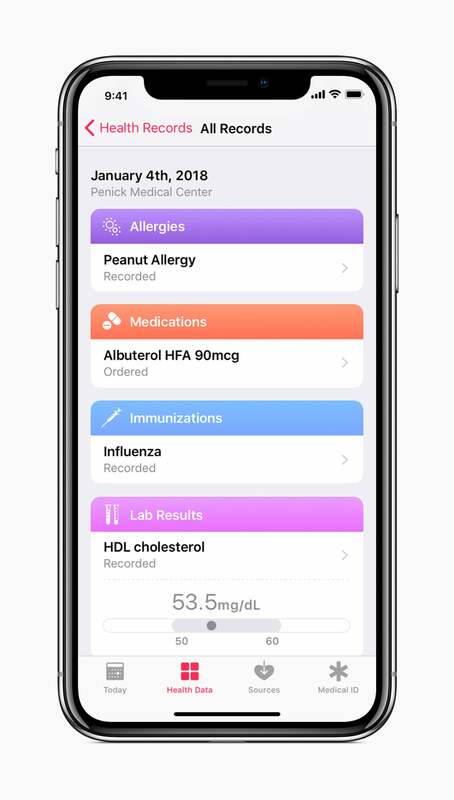 Apple's new Health Records feature uses the existing Health app (released in 2014 for iOS 8) to enable medical facilities to connect via an API to their EMR systems to share data between providers and patients. Medical records on Health Record are organized in an easy-to-understand timeline. The HITECH Act of 2009 required healthcare facilities to implement EMRs. EMR data sharing between disparate vendor platforms, geographically dispersed facilities and unassociated medical institutions, however, flatlined for years. Healthcare Information Exchanges (HIEs), which enabled data sharing, remained at a standstill mostly because of industry pushback, much of it from EMR vendors themselves. Each EMR vendor had its own proprietary data formats, so sharing information was difficult at best with healthcare facilities that relied on systems from a different vendor. In the past several years, however, the Fast Healthcare Interoperability Resources (FHIR) interface, a draft set of standards, has been made available for every major EHR. It will enable the aggregation of EHR and other data from disparate facilities. Apple's Health Record app is expected to take advantage of FHIR for its EHR data aggregation, as well. Additionally, recent EMR vendor collaborative alliances are also helping in the effort. Two of the more successful interoperability frameworks are the CommonWell Health Allliance and Carequality, which has been adopted by two dozen vendors. "They're essentially saying we're committing to more open health information exchange," Shegewi said. 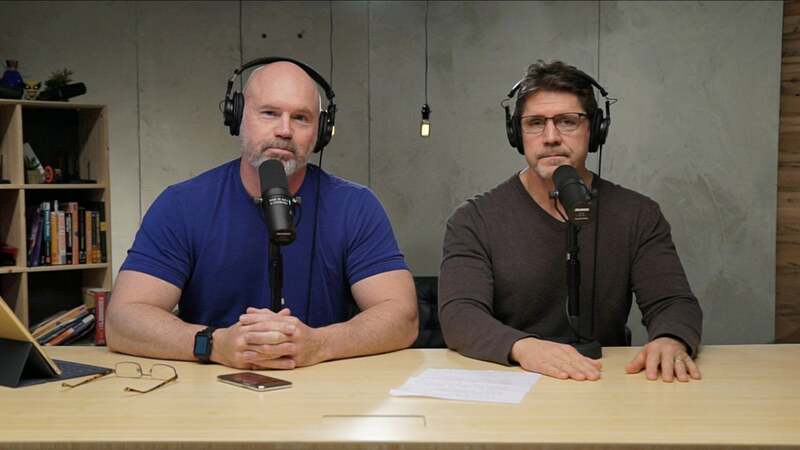 "I'm thinking the Apple Health Record will probably be syncing up with something along those lines or some form of direct health information exchange." By 2020, one in four patients expects to be participating in a "BYOD" – bring your own data – healthcare scenario, according to research by IDC. "You can appreciate this with all the wearables, trackers and mobile applications that allow you to notate and document things like nutrition, fitness and calories burned. That information is rich and important to have for [healthcare] providers as long as there's integrity around that data," Shegewi said. "The fact is, doctors don't know what happening with you once you leave their office." Adoption, however, will be key to Apple's success. 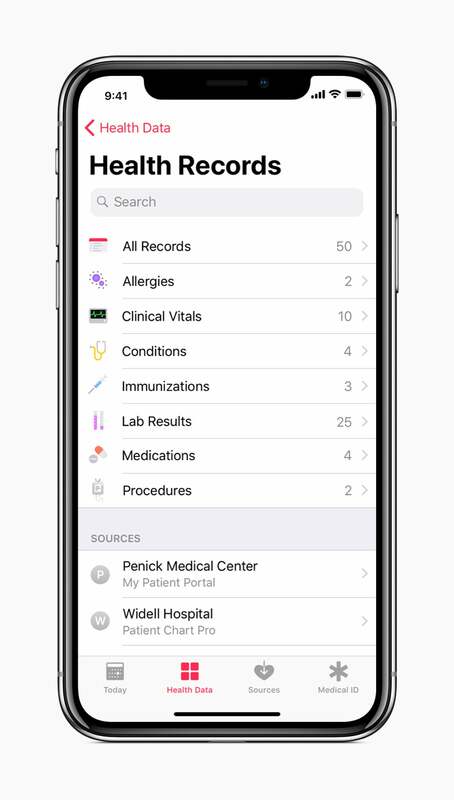 At its launch last month, the new Health Record feature was available to the patients of 12 hospital systems via the iOS 11.3 beta, according to Apple. Then there's security. Healthcare information is the most sensitive data on the black market today. In the past, consumers have voiced fear about something as personal as a medical record being introduced in electronic form. Healthcare information is arguably the most sensitive data there is because once it's disclosed, it can be used by cyber criminals for nefarious purposes for a lifetime. Ensuring patient data is made available in a read-only format and that none of it is actually stored on Apple's cloud servers, is a good start, according to John Halamka, CIO at CareGroup Healthcare System and CIO and associate dean for educational technology at Harvard Medical School. Shegewi agreed, saying features such as fingerprint and facial recognition go a long way toward ensuring data cannot be stolen from a physical device. "If for some odd reason I decide to take a screen shot of my information, that can be stored anywhere. Those places may not be as secure," Shegewi said. "Or, if I email it off and it's intercepted by some means, those are more of my concerns. "There has to be a way to find a balance between having patient access and producing good level of security."